Republican Senator Jeff Flake takes his party to task for embracing nationalism, populism, xenophobia, and the anomalous Trump presidency. ...the book is at its most compelling when Flake shows how he developed the conservative worldview that would make Trump so anathema to him ... Publishing this book is a true act of political courage. Many conservative intellectuals have cogently made the case against Trumpism since the billionaire came down the escalator at Trump Tower two summers ago, but Flake is the first sitting senator to do so in book form since the president took office ... As future generations study this tumultuous time, Conscience of a Conservative — in many ways a sequel to Goldwater’s 1960 book of the same title — will be an important data point. It’s striking how many influential figures in this slim volume he manages to impale with a stick and then lightly spit-roast. Newt Gingrich (a 'character with extraordinary talents for self-promotion'). Michael Flynn ('conspiracy theorist'). Alex Jones ('one of the most egregious polluters of civil discourse in America'). But above all others: Donald J. Trump ... Flake is the first elected official to cross this particular rhetorical Rubicon, and he seems to be imploring his colleagues to follow. 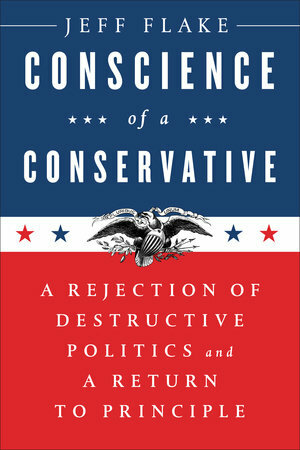 He offers a despairing, unsparing indictment of everyone in Congress who went along with Trump’s election ... Conscience of a Conservative has an undeniable rhetorical power — it is fluid, well written, mature in tone. But Flake also has the material power to change things. How reconcilable are his words with his deeds? ... The primary intellectual failing of Conscience of a Conservative is that it doesn’t untangle the dysfunction in Washington from the dysfunction of his own party. Flake’s book sacrifices an actual philosophy of conservatism for a sentimental and often disingenuous plea to make America decent again ... At its best, Conscience of a Conservative is both solemn and fiery, an excoriation of Flake’s own party and president. He describes his party’s embrace of Trump as a 'Faustian bargain' that 'wasn’t worth it,' because Republicans deluded themselves about Trump’s true nature ... But what the reader may not know about Jeff Flake, and which he certainly doesn’t reveal in his short book, is that he has voted with Donald Trump 95 percent of the time ... Flake’s conservatism is mostly a mix of worn cliches about self-reliance (learned, as they so often are, on a rugged Arizona ranch) and freedom ... There is no serious diagnosis of the historical trends that led to the Republican Party becoming a vehicle for corporate libertarian extremists like the Koch Brothers ... As far as words go, Conscience of a Conservative is as good a takedown of Donald Trump as has been written by a conservative. But words aren’t what matter now. What did you think of Conscience of a Conservative?